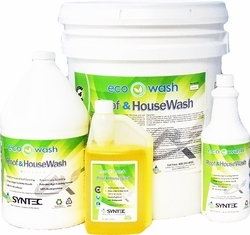 EcoWash Roof And House Wash Will Not Degrade Bleach! House & Roof Wash is a revolutionary new product formulated for the house and roof washing professional. This incredible product is added to a hypochlorite solution to prolong its effect while allowing concentrations of bleach to be cut in half. Roof and House Wash can also be used alone without bleach to clean surfaces to remove dirt, debris, and other environmental stains. There is a patented deodorizer package built into the product that will help mask the scent of traditional bleach and non bleach solutions. � Highly foam levels. � Keeps bleach wet longer allowing it to be more eff ective. � Allows for use of more diluted bleach solutions. � Many times bleach solutions can be cut in half. � Great for use on houses and roofs. � Contains citrus oils that help mask bleach odors. � Foam quickly carries away dirt and debris from surfaces. � Environmentally Safe & Biodegradable. For House And Building Washing: Mix 6 - 8 oz to 5 gals of 12% Sodium Hypochlorite. Ratio onto surface ap- prox. 7:1. Roof Washing: Mix � gallon to a 55 gal drum of 4% Sodium Hypochlorite, Mix 3 qts to a 30 gal drum of 4% Sodium Hypochlorite, Mix 4 - 6 oz to a 5 gal pail of 4% Sodium Hypochlorite. If using a 6% solution or 12% solution of bleach, use the same mix ratios as stated above. NOTE: Before using any solution that contains bleach (Sodium Hypochlorite) make sure all applicators, tanks, and storage containers are approved for use with bleach and contain the appropriate venting devices. If you are unsure if any device being used is appropriate for use with bleach, DO NOT USE IT until you contacted the supplier of the machinery and containers. Misuse and incorrect storage is considered dangerous and detrimental to health and safety of the user. Once product is mixed, apply to desired surfaces. Foaming will allow solution to work longer and more effectively on the surfaces, requiring less labor and less cleaning solution. Rinse with the least amount of pressure possible needed to get the surface clean. Warm water can allow for better performance and expedited rinsing. Use caution when using heat on various substrates.